This 77-year-old man presented with left knee pain. 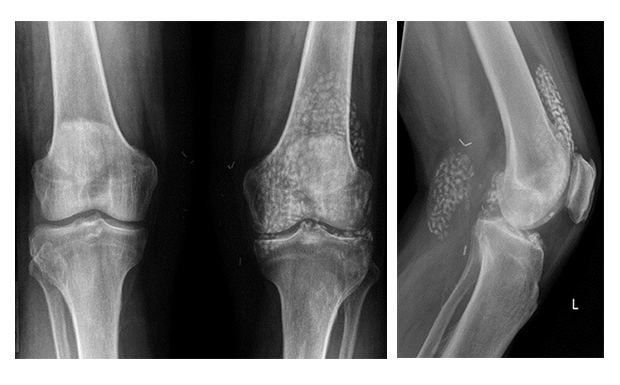 Radiographs demonstrated multiple intra-articular bodies with varying degrees of calcification throughout the left knee joint and within a Baker’s cyst, characteristic for primary synovial osteochondromatosis. Synovial osteochondromatosis is typically described as a non-neoplastic process resulting from metaplasia of the synovial membrane and formation of multiple intra-articular bodies, measuring between 2 mm-2 cm in size. The intra-articular bodies may be present with no calcification (synovial chondromatosis), fine speckles of calcification, or larger laminated bodies and ossification. These bodies can be found within the joint, bursa, or tenosynovial structures and tend to occur in a monoarticular, large joint distribution. Secondary pressure-related erosions or a soft tissue mass may be the only radiographic signs. MRI is most sensitive, as non-ossified bodies may be undetectable on radiographs or CT. Although most intra-articular bodies demonstrate low-intermediate T1 and high T2 signal intensity, the appearance is variable based upon composition. Differential considerations include multiple calcified intra-articular cartilaginous defects resulting in loose bodies with advanced degenerative disease (secondary synovial osteochondromatosis), which are generally fewer in number and more variable in size. In cases of synovial chondromatosis, differentials include rice bodies in rheumatoid arthritis and pigmented villonodular synovitis. Treatment includes surgical removal of the intra-articular bodies with synovectomy in symptomatic patients. Local recurrence may occur after incomplete synovectomy. McIntosh L. At the Viewbox: Synovial Osteochondromatosis. J Am Osteopath Coll Radiol. 2013;2(4):32. Dr. McIntosh is with the Department of Radiology, UMass Memorial Medical Center, Worcester, MA.